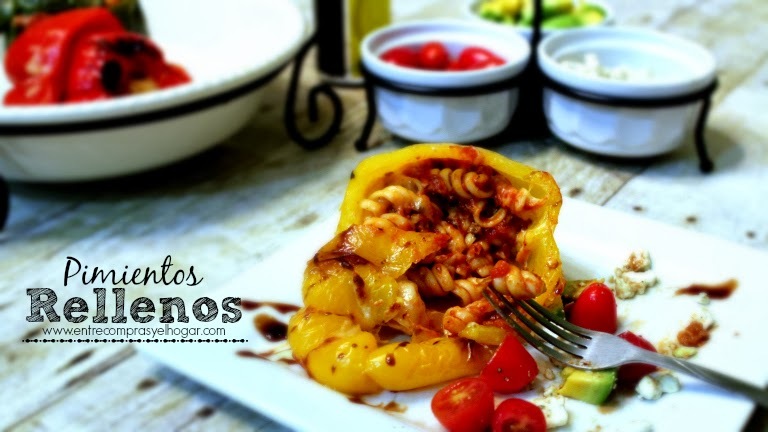 Recipe for stuffed peppers with pasta: I love to prepare this dish in the fall and winter season, It’s easy and economical to prepare, It’s delicious, colorful and fun recipe for the entire family to enjoy. I like to accompany it with avocado and tomato salad feta cheese. Placed in pot boil water and place the peppers for about 3-4 minutes then remove the skin. Cook TSP, then add half the marinara sauce. In the same water where the peppers are blanched, place the pasta until al dente, when ready drain pasta, Add the remaining sauce and TSP. Stuffed peppers with pasta and cheese: place in a suitable baking sheet and bake for 15 minutes at 375F. Remove from oven and sprinkle with vegan parmesan cheese. You can accompany a salad, and garlic bread. The stuffed peppers with pasta looks delicious! I love pasta and this one look easy to make at home. Thank you for sharing another great recipe. Yo siempre los relleno de carne, voy a probarlos con pasta. Que delicioso se ve. Muy buena idea! Qué delicia, muchas gracias por la receta. Yummy!